April | 2011 | love lives on. Regardless of wether you go with an all-breed rescue group or one that is breed specific, many of the group’s volunteers really know breeds well. Tap into this knowledge. Most rescue groups out there want you to be realistic about your breed and ultimate dog choice. You may have heard some of these before and while some are generalizations, most are proven: Border Collies have energy. Bull Dogs and pugs snore. Labs are underfoot 24/7. Beagles howl. There are many dog breeds who require constant exercise and there are plenty that would much rather enjoy couch time. Within each breed there will be exceptions to each and every rule. None of these quirks are shared with you to scare you off; a rescue groups main goal is to find dogs their forever homes. Most don’t place dogs quickly, you have to apply and show your potential as a ‘forever home’ provider. Most times when you rescue a dog you pledge to that group that if you should ever have to give the dog up, you’ll give them back to that group. That’s why the match process is so important, if they have to take one of their dogs back in, that is one future dog in need they may not be able help. No one wants to sell you a bill of goods. Know upfront so you can tackle your breed’s uniqueness head on. Melvin is only perfect in my eyes (and sometimes that is with me closing one eye and putting mesh over the other). If a stranger is nice enough to stop and pet him, they will find themselves covered in slobber (it requires a washing machine to remove) and hair. In the past three years I have tripped over Melvin no fewer than 743 times; he is apparently happiest when he is as close to my feet as possible. He is six going on one, the puppy years may last forever. He gets more water on the floor than he gets into his mouth and after drinking his mouth drips with reserve water for 20 feet. If allowed onto the bed, there will somehow be no room left for others. He eats socks and acorns. He sheds an impossible amount of fur daily. He is more than willing to dislocate my shoulder by pulling on the leash to get to a squirrel or cat. He sometimes pees when he meets someone new (sheer excitement) and he once had the trots for six weeks. Despite it all, I love him. I’m fairly certain he overlooks much more in me. Due to house showings, Melvin has had a lot of car time lately. As challenging as running errands with him in the car can be (I worry I’m being judged for leaving my dog in a well ventilated car on a 60 degree day so I run into various locations at top speed and refuse to do any errand that takes longer than 4.3 minutes), the one perk is that he’s getting really good about staying seated int the back seat. When I first got him his preference was to sit in my lap in the front seat. While hysterical to see and experience, it was neither practical or safe and I spent several months coming up with clever ways of keeping him in the back. Clearly we’re making progress! 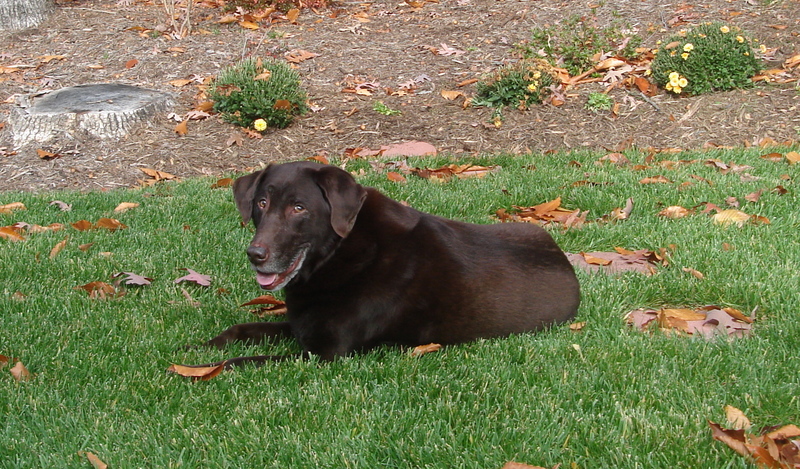 Max was a Chocolate lab. Super sweet and furry as a puppy, wild during his teenage years (and well into his 30’s). During the wild times, I thought my parents might set him free. Eventually, as he grew older we were able to look back with gut wrenching laughter. Those moments easily become some of your favorites. It was however in Max’s golden years that I learned how true the phrase “old dogs are the best dogs”. Not because he was older and less energized to misbehave. He found plenty of mischief at every age. But he had a soulfulness about him that was so peaceful. It made me realize what a beautiful thing the dog mind is. They don’t think backwards. They don’t count their regrets. They live in the here and now and that soulfulness stems from being happy in and for every moment. In fact, towards the end of his life when I asked the vet the painful question about whether I’d know when it was ‘time’, she told me with dogs like Max, the really happy, food motivated dogs, I probably wouldn’t ever have complete certainty. She predicted he’d thump his tail for me up until the end. He proved that theory to be correct. 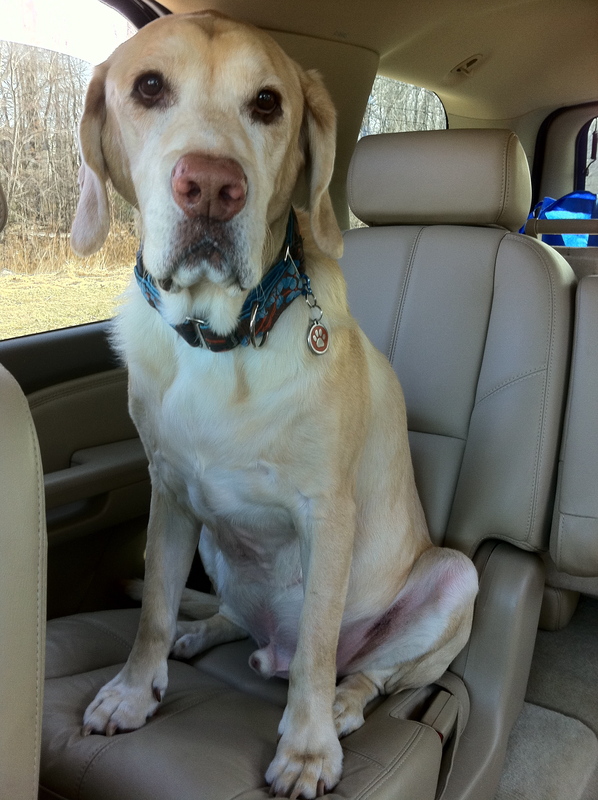 When I started the search for a Lab to rescue, I was in many ways looking for Max #2. Not a replacement (Max was still with me), but in my head I hoped I would get as lucky twice around. That was probably misguided but I had a ‘type of lab’ in mind so I set out to find the right rescue group. Many breed specific rescues are close by where you live. Some will only place dogs in local forever homes whereas others have broader rules for that. A search in google for “dog rescue groups in Virginia” yielded over 50 pages of results. When you’re in the thinking-about-it-phase, start there. I did. Once I decided to go the route of rescue, I checked out countless rescue groups. If you go with a rescue group, you often get a little more information about the dog you’re considering. Many rescue groups trial the dogs in homes and many dogs are fostered in homes the entire time they are with them. This was important to me. I in no way want to diminish the beauty of your local shelter, your canine soul-mate might be at one this very minute. Some of the sweetest dogs I’ve met had stays in local shelters. For me, since I was bringing a dog into a house with an aging resident dog, it was important to do some extra investigative work on dogs that would do well with other dogs. It was also imperative to find a dog that didn’t require a yard. Some dogs really need that run free time on a daily basis and while I was committed to daily walks, off-leash outside playtime was going to be very limited. I started with a few non-specific breed rescue groups. These are rescue groups that take in any and all dogs (and puppies). No breed is too big or small. They can often give you specific information about the dog like whether it is house-broken, good with dogs/cats or small children. Regardless of what they know and tell you about the dog, be realistic. If you take a house trained dog home, it might still have an accident. You should always introduce two dogs carefully (more on that later) and even if a dog is child friendly, you need to test that on your own with your little one. These rescue groups do the best they can to assess the dogs but you need to do your own assessment. The goal should be (for both rescue group and you) that the rescue of the animal is forever. If you’re in the Washington DC metro area, a few of these all breed friendly rescue groups include: Friends of Homeless Animals (they are updating their website so be patient); Lost Dog Rescue ; A Forever Home Rescue; PAWS Rescue of NOVA. Although I considered many dogs from these rescue organizations, I ultimately went with breed specific rescue group. More on that in the coming week. Melvin has a special love for the furry pillow. The Humane Society of the US estimates there are 135 millions cats and dogs in homes in the US. Shelters in the US care for six to eight million dogs and cats each year. Three to four million cats and dogs are euthanized in shelters each year. That’s half of all the cats and dogs in shelters. These statistics do not account for smaller/more local shelters who may not report their activity to the Humane Society and does not take into account many private rescue organizations. Why so many homeless animals? Twenty percent of the animals currently in shelters were there before. Someone adopted them and somewhere along the way changed their mind. Owning a pet can be overwhelming and many return the animals due ‘buyers remorse’. Other contributing factors include economic struggles, relocation or dissatisfaction with the specific pet. Other pets in shelters show up there on their own as strays. Some are brought in as a result of mistreatment and abuse. Whatever the reason, no matter where you live, there is an animal close by who needs love. Unconditional love, the type of love that is forgiving and everlasting. Owning a pet is a huge commitment. They need you for almost everything. If you don’t walk them or exercise them, many will use their pent up energy in a way that makes you unhappy. If you don’t let them out, they may have accidents in the house. If you don’t feed them, they will seek food that you don’t want them to eat. If you want them to behave in a certain way, you owe them the due diligence of consistent training. Food, vet and supplies for a pet cost money. It’s a partnership, you are a required participant in their well being. The benefits of loving a pet are unending and while it would be easy to give ten pluses for every challenge, at this point in the decision to adopt a homeless pet the benefits are not going to be as apparent. You have to realistically commit to the work. The joy comes afterwards.